I am very pleased and honoured that the Police of the Czech Republic received the offer to present its activities in such an important event as the Future Forces Forum (FFF) is without any doubt. The Future Forces Forum is exactly the kind of action, which is according to my opinion necessary to organise regularly. In the relatively short time period many subjects, which have to say something to contemporary questions in the area of the newest trends and demands concerning the safety and security and defense, could be presented in one place. I consider as a very beneficial for all participants mainly the connection of practical demonstrations and subsequent discussions on the topic. We as the police together with the Army of the Czech Republic ensure the safety and security of the Czech Republic. In this connection I would like to highlight the co-operation of these two security bodies, which was realised last time for example during the excercise focused on the protection of state borders regarding possible migration risks. The Police of the Czech Republic has been changing and developing all the time. Inhabitants do not apprehend it as something „troublesome“ anymore, but as the modern security body providing their safety and security. Not to fall short of their confidence, it is necessary to support exactly these types of actions, where we have the possibility to monitor the current development in the field of the internal security. From this point of view we consider our participation at the Future Forces Forum as the possibility to develop and to improve our further co-operation with other parts of the Integrated Rescue System as well. The proof of our interest to evolve this co-operation is for example the opening of the training polygon in Zbiroh financed in the frame of the Swiss and Czech co-operation. The above mentioned polygon is used besides the Police of the Czech Republic also by members of Fire Brigades, Army of the Czech Republic, Health Rescue Service and other parts of the Integrated Rescue System. 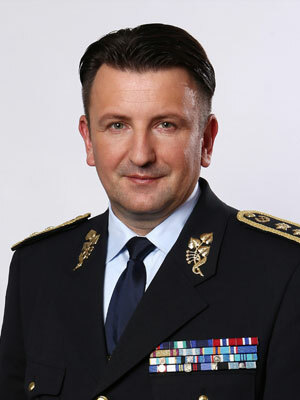 The Police of the Czech Republic provides the internal security at the territory of the Czech Republic. Regarding the current development in the field of migration problems we express our copartnership concerning the protection of Schengen outer borders by the deployment of our police officers to Macedonia, Hungary, Slovenia and Greece. In the frame of the international co-operation the mission of Czech police divers to Bosnia and Herzegovina was realised. The team of divers has continued in the gradual and very dangerous mine clearance from the Sava river (the residue from the war in years 1992-1995) during the stay in these territories. In this connection I would like to mention that the equipment of police divers, which is by the way on the high level, was purchased from the financial means of European funds. Thanks these funds the purchase of police boats for the surveillance over waters was realised. I would like to to use this occasion to inform you that after the reception of the offer to present the Police of the Czech Republic at the Future Forces Forum I decided without any hesitation about the participation of our security force in this, for us so important, event.